Infinite Art Tournament: Element of the Month: Bromine! When you think "liquid element," you think of Mercury, am I right? Of course I am. But there are actually two elements that are liquids at room temperature! So what's the other liquid one? I would have said "Iodine!" but I would have been dead wrong. 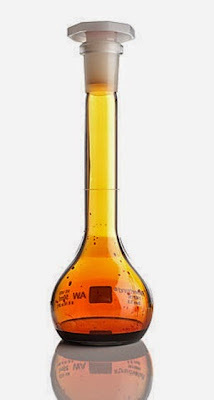 What I'm thinking of as "Iodine" is actually tincture of Iodine, a solution. Iodine proper is a silvery metal that emits a violet gas at room temperature, which is pretty damn cool. But this should not overshadow the actual other liquid element, which is Bromine. Bromine is pretty volatile stuff, prone to react with any other elements that happen along, so in nature is occurs mostly in the form of salts. There's quite a bit of it in the ocean. But if you trick it into pure elemental form, you get a heavy brick-red liquid. Specifically, you get a "heavy, volatile, mobile, dangerous reddish-brown liquid," says webelements.com. The Wiki describes it as "fuming," and I'm led to believe that an orange vapor steams off the top of it. This sounds nearly as cool as Iodine! But Bromine is also toxic, corrosive, and "incompatible with most organic and inorganic compounds," so get that idea of a nice long Bromine bath out of your head right now. No good would come of it. Incidentally, the freezing point of Bromine is -7.2 °C, 19 °F, which is the temperature of an exceptionally cold winter day unless you live in Vermont or something. Next winter, when it gets really cold, I urge you to come indoors and exclaim "Phew, it's cold enough to freeze Bromine out there!" Through modern history, Bromine compounds have been used in a veritable parade of unwise applications. Methyl Bromide and Ethylene Bromide were popular pesticides, but their use has been discontinued since this kind of Bromine compound, like similar Chlorine compounds, turn out to attack the planet's highly desirable ozone shield. Before that, it was used as an additive in leaded gasoline, to mitigate the effects of the highly toxic lead that really shouldn't have been put in gasoline in the first place. In World War I, Xylyl Bromide was used as a chemical weapon, and Bromides were used in the production process for the original recipe of Mountain Dew. So, this has not been an especially happy branch of industrial chemistry. However, Bromine compounds also have less depressing uses in flame retardants, drilling fluid, water disinfection, and old-school photography. Elemental Bromine was simulaneously discovered in a Newton-Leibnitz sort of tie by brainy French scientist Antoine Jérôme Balard (1826) and brainy German scientist Carl Jacob Löwig (1825). 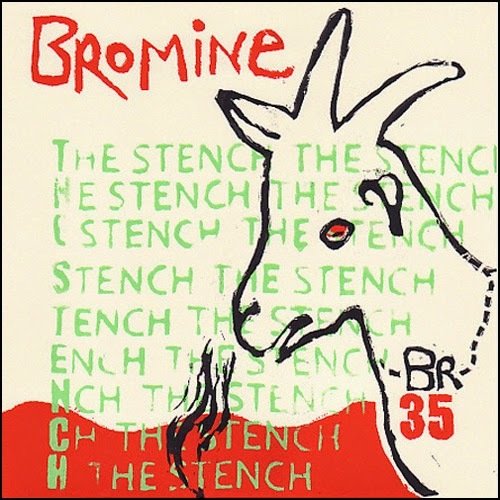 After originally suggesting "Murine," Balard changed his mind and went with "Bromine," which is basically Greek for "stinky." Did I mention that Bromide stinks? It's really not a very loveable Element, I'm afraid. Bromine, print by Robin Lookability. Discovered here. this way. I would have asked nicely, but I couldn't find an email address for ya. "What I'm thinking of as "Iodine" is actually tincture of Iodine, a solution." ahhhhh, thank you for this clarification! also, i used to be quite the fan of Mountain Dew.